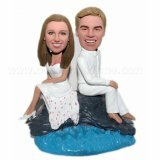 This custom bobblehead doll depicts the bride and groom on the beach and next to the water. 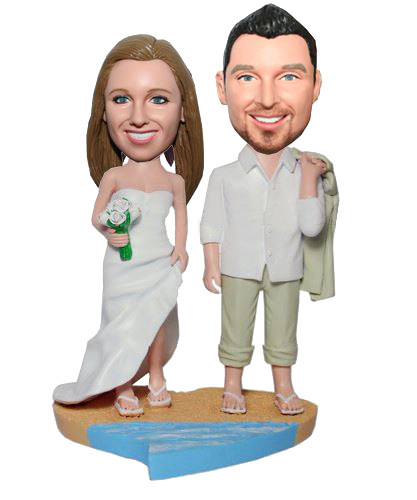 The bride is wearing her casual beach wedding dress, and the groom has his linen suit jacket draped over his shoulder.So so so romantic. Every girl likes her wedding holding near the sea.Remember the day you become his wife and he is groom by making these custom bobbleheads. 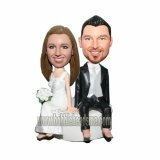 It's ideal gift for wedding, engagement or anniversary. AMAZING! 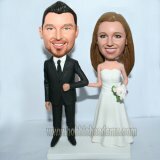 They did the bobbleheads exactly as wanted and sent photos before baking any part so we could approve.